train 1 million Europeans in crucial digital skills by the end of 2016. Today we've begun to put those plans into action in the Netherlands with the launch of the Digitale Werkplaats (Digital Garage) in the city of Eindhoven, a two day training programme. In the Netherlands, more than 40% of the labor market is made up of small business owners and independent contractors. Why Eindhoven? Eindhoven is often called the digital capital of the Netherlands, and the region is rich with digital startups that were born there and have grown to international successes. Companies like 3D printing marketplace Shapeways, and Study Portals, which connects students to international travel opportunities, and which are familiar with the ways that the web can accelerate a business. With the Digitale Werkplaats we aim to bring the opportunity to use the Internet as a growth engine to the small businesses and independents of the region. And there’s plenty of growth opportunity--in Eindhoven 80% of small businesses have fewer than 20 employees. We’re not alone in these efforts. All across the country governments and SMB organizations are recognizing the need for digital skills--from online marketing to general proficiency in web tools-- in achieving growth. We’re keen to be playing our part. It's simple: SMEs throughout the country get training in the essential digital skills they need to grow online. We'll partner with Dutch microfinance organization Qredits, and both small business associations and local governments to achieve big results: our goal is to train 30,000 people in the Netherlands by the end of 2016 through in-person events like this week's and online trainings. 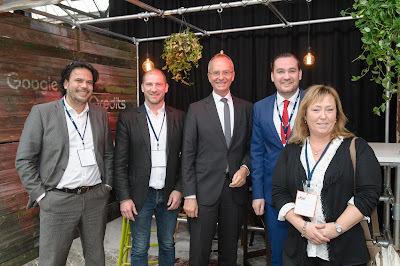 This morning in Eindhoven the Dutch Minister of Economic Affairs Henk Kamp said: "The Netherlands is one of the most innovative countries in the world, in part because of its strong tech infrastructure. To ensure our country remains competitive, the skills needed for using technology have become indispensable for SMEs. These entrepreneurs create a lot of new jobs and play an important role when it comes to developing products and services. By helping SMEs to become better at using technology, we're building a stronger fundament for economic growth, which leads to more jobs. Google's initiative deserves praise, because it enables this development." Elwin Groenevelt, the general manager of Qredits Microfinance, explained in Eindhoven that they have created 10,000 jobs in the past five years by financing Dutch 7,000 entrepreneurs. By partnering with Google, giving workshops on the topic of microfinance, they want to offer even more opportunities to ambitious entrepreneurs to achieve their growth objectives. There are many Dutch entrepreneurs who have achieved growth through their smart use of the Internet, and we’re excited to meet thousands more over the next year. What’s inspired us is that these business owners and independents come from all different backgrounds and levels of tech-savvy -- three that we’ve met in Eindhoven are husband and wife pair Henk Jan Bruil & Irene, who aspire to scale their new soup and salad bar, PIT, nationally; Wendy Govers of Trimsalon Pet’s Choice, who has seen her clientele of dogs and cats grow from 20 to over 500, and Marie-Louise Holl of Holl Klompen, whose 40+ year souvenir business ships “Made in Holland” souvenirs all over the world thanks to the reach of the web. See here for more Dutch success stories. Last February, we invited entrepreneurs from across Europe, including the Netherlands, to celebrate their online success stories in Brussels. At the same time we made a commitment: to train 1 million Europeans in crucial digital skills by the end of 2016. Today we've begun to put those plans into action in the Netherlands with the launch of the Digitale Werkplaats (Digital Garage) in the city of Eindhoven, a two day training programme. In the Netherlands, more than 40% of the labor market is made up of small business owners and independent contractors. Sounds promising! Do people have to sign up at Qredits Microfinance, or at Google? How good is your YouTube?